The Mountain Weather Information Service (MWIS) produces detailed weather forecasts for the main mountain areas in Scotland, England and Wales. The Metoffice also produce detailed weather forecasts for 7 main mountain areas across the UK. The accuracy of weather forecasts is improving decade by decade, but you should always bear in mind that weather, particularly in mountainous areas, is extremely unpredictable. Even short-term forecasts are unreliable. At best, forecasters are making a statement about the probability of certain weather conditions, especially where they perceive a likelihood of extreme weather conditions. 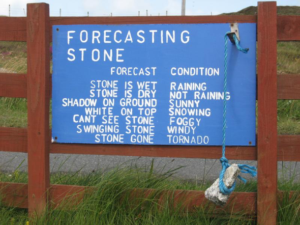 So weather forecasts are hugely important to walkers, scramblers, climbers and skiers, and should always be consulted, but can never be taken as the definitive truth. Your own observations of weather conditions on the day should always override even the most confident forecast! We always compare at least two weather forecasts, to provide us information and reduce any discrepancies we come across. But please keep in mind, these are only forecasts, although very good nowadays, these are predictions based on historical information, and history does not always repeat itself.